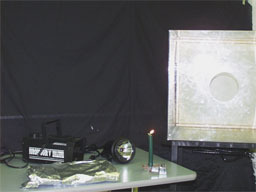 The so-called vortex generator is simply an empty box with a round opening in the front and a rubber sheet for the back. Pushing the rubber sheet forces air out the hole in the front of the box. A vortex is a bunch of air or water that is swirling around itself. Tornadoes and whirlpools are good examples. When the air is forced out the front of the generator, some hits the edges of the hole and slows down. This slower air is then pulled forward by the faster moving air in the center and starts swirling around itself in a ring. 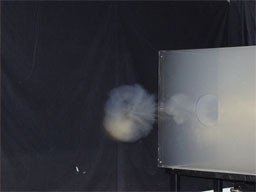 The vortex can travel a large distance before breaking up if the air in the room is calm. NEVER use Liquid Nitrogen with the polycarbonate Vortex Generator. The plastic will become brittle and crack. Although the Generator looks simple, it cost quite a bit of money because of its size and materials. TREAT IT CAREFULLY. The fogger takes about five minutes to warm up before it can be used, so plan ahead. 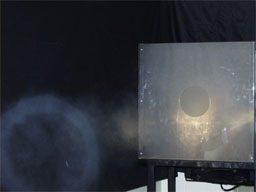 The fogger can emit small bursts of fog by itself. This is normal. After it has been on for a long time the fogger gets hot so hold it by the handle only. For information: the fog fluid is non-toxic and water based. It has an unusual scent, but since we're not filling the room with it, most people won't notice. This demo usually follows Magdeburg Hemispheres, so you can tell the kids we're going to be talking more about air. We know that air weighs something, so now we can use that information to do stuff. You may want to ask the kids if they've ever been able to blow out all the candles on their birthday cake. Light the candle and ask the kids if they can blow it out without getting up from their seats. Have everyone blow at the same time. See if they know why it didn't work (some will say because the candle is too far away). Hand off the candle to someone else and bring out the Vortex Generator. Show them that it's just a box with a hole and a rubber back. Explain to the audience what the Generator is used for, and a simple version of how it works. Show them that the vortices carry a lot of power by smacking a few into the Mylar sheet (from a large distance). You may have to hit the rubber REALLY hard. You can now easily blow out the candle from a distance. If you have trouble directing the vortices to the right spot, put the fog in a little early to help navigate. Tell them that filling up the Generator with fog just makes it easier to see the rings of air when they come out. Go ahead and fill it up (about 2 seconds' worth of fog is plenty), and have someone else man the spotlight from across the room. With the spotlight directed at the Generator, it is very easy to see the rings as they travel. Turn the Generator on your audience and let 'em have it! !